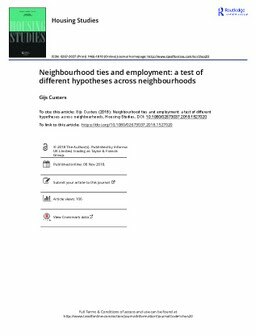 This study examines to which extent neighbourhood ties relate to employment status for the less-well educated inhabitants of 71 neighbourhoods in the Dutch city of Rotterdam. Previous research has produced different expectations as to whether having contact with neighbours is either positively or negatively related to being employed and how this relation differs across neighbourhoods. Two waves from the Neighbourhood Profile survey (N = 8507) were used, which included measures of the contact frequency with neighbours and their willingness to help. We find that for the less-well educated neighbourhood ties have a modest negative relation to employment. Moreover, this relation does not vary across neighbourhoods with different socioeconomic statuses, with the exception of part-time working men. Our research implies that neighbourhood ties in mixed neighbourhoods do not positively relate to employment for the less-well educated, thereby questioning policy assumptions about ‘social mix’. Contributions to the field of neighbourhood studies are made by employing measures of the social networks mechanism and taking into account the conditionality of effects across neighbourhoods.